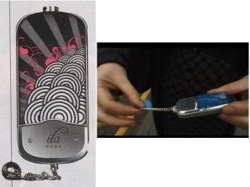 Ila Dusk Personal Alarm Takes A Passive Approach To Personal Safety | OhGizmo! If you’ve ever wandered down a dark alley and worried about who you might meet, you’re not alone. There is a giant market for self-defense gadget, especially ones marketed toward women. Unfortunately if you pull out a can of mace and don’t manage to get your attacker in the eyes, it’s only going to make the situation worse. The Ila Dusk Personal Alarm (named after the Hindu goddess of speech or voice) takes a different approach by emitting a hi-pitched 130 decibel shriek based on a female scream. Granted, I’m no seasoned mugger, but if I heard that thing go off, I’d be getting the heck out of there. If that sounds anything like a scream, someone is going to come running. Honestly, any loud noise is going to attract attention. For around $34, it is certainly worth it, plus it looks a bit more stylish than a Taser in your purse. Wow, that's really cheap for something that looks so good! Cheap security!